The main goal of this report is the presentation of a comparative evaluation of the quality of new H.264 codecs using objective measures of assessment. The comparison was done using settings provided by the developers of each codec. The main task of the comparison is to analyze different H.264 encoders for the task of transcoding video—e.g., compressing video for personal use. Speed requirements are given for a sufficiently fast PC; fast presets are analogous to real-time encoding for a typical home-use PC. 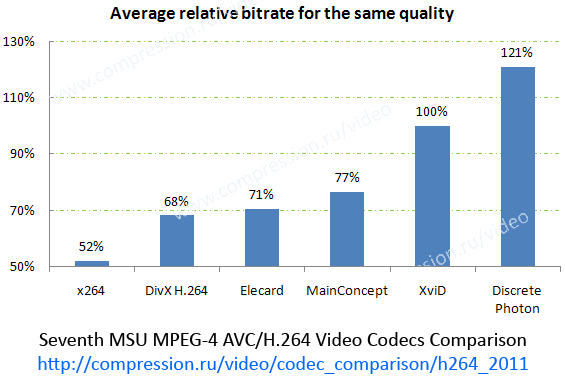 Overall, the leader in this comparison for software encoders is x264, followed by DivX H.264, Elecard and MainConcept. This rank is based only on the encoders’ quality results. Encoding speed is not considered here. The Video Group would also like to thank these companies for their help and technical support during the tests.